Astronaut photograph ISS039-E-3841 was acquired on March 21, 2014, with a Nikon D3S digital camera using an 800 millimeter lens, and is provided by the ISS Crew Earth Observations Facility and the Earth Science and Remote Sensing Unit, Johnson Space Center. The image was taken by the Expedition 39 crew. It has been cropped and enhanced to improve contrast, and lens artifacts have been removed. The International Space Station Program supports the laboratory as part of the ISS National Lab to help astronauts take pictures of Earth that will be of the greatest value to scientists and the public, and to make those images freely available on the Internet. Additional images taken by astronauts and cosmonauts can be viewed at the NASA/JSC Gateway to Astronaut Photography of Earth. Caption by M. Justin Wilkinson, Jacobs at NASA-JSC. 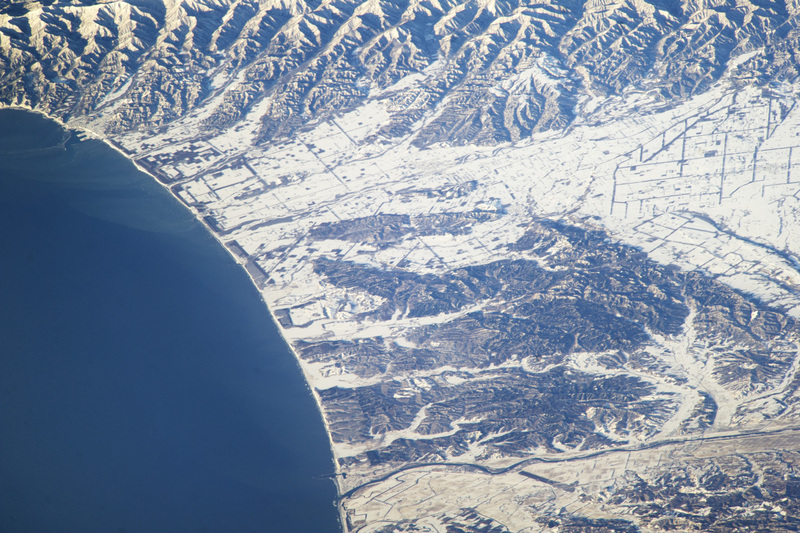 Unusually heavy snow fell on northern Japan this winter, and it helped highlight the flat, fenced landscape used for agriculture. In this photograph taken from the International Space Station, the Tokachi River reaches the arc of the Pacific Ocean on Hokkaido’s east coast. Forests on steeper hillsides mask the snow and appear dark. This detailed view was taken with a long lens from more than 800 kilometers (500 miles) away. It shows the narrow greenbelt forests that line the coast. Planted in Japan for at least the last four centuries, greenbelts protect coastlines from storms and sand movement; they are increasingly providing recreation areas as well. Greenbelts reduce tsunami wave energy, protecting houses and roads from floating debris. Such forests reduced the destructive effects of the 2011 tsunami at Sendai by “catching” seagoing vessels and preventing them from being washed inland.